This is high adventure. First, your helicopter will fly you over downtown Juneau out to the mighty Taku Glacier, where you will don survival suits and board your airboat. You'll ride up to the face of the Taku Glacier for an amazing chance for breathtaking photographs! 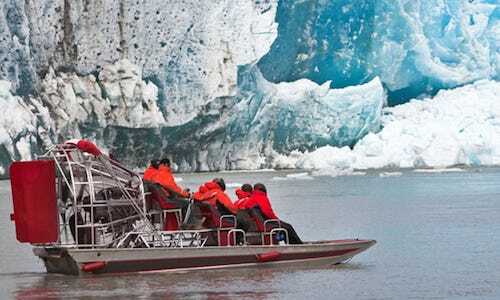 On the return leg of your experience, we will land your party at a lower level of the Taku Glacier for an experience to see some beautiful features of glacial movement that are really highlighted at the more advanced edge of the glacier.